It's a reality.... FINALLY! 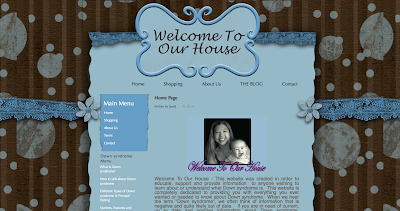 I have finally published my Down syndrome resource website. It took me a year to put it together (and for no other reason other then lack of time) and finally press the "GO" button! Now, the site is not totally completed, and I have so much to do, but I realized it was silly of me NOT to allow the public the opportunity to use, read and gain knowledge from it while I still work on it. It was pretty unrealistic of me to think I shouldn't unveil it with more work to be done. Like my book, I still have much to do with it - it's definitely still a work in progress. I still must add the stories and photo's of the many people who contributed work that I requested and then gathered, which is also to be published in my 4th book. I hope everyone who reads my blog will take the time to visit my resource website. The site houses Down syndrome resource information, medical information, personal views, websites, blogs, personal and other family stories and of course my books and magnet. I hope as members of our community get the chance to visit it, they will advise me of their thoughts, ideas and suggestions. I certainly would love to reference the many blogs that pertain to Down syndrome - so if you would be interested in having your blog listed on my website, please send me a contact message either through this site or the new website! Keep watching (here or there) for updates to the site, daily. Nice website. Lots of information. I am sure your fans will find it useful.